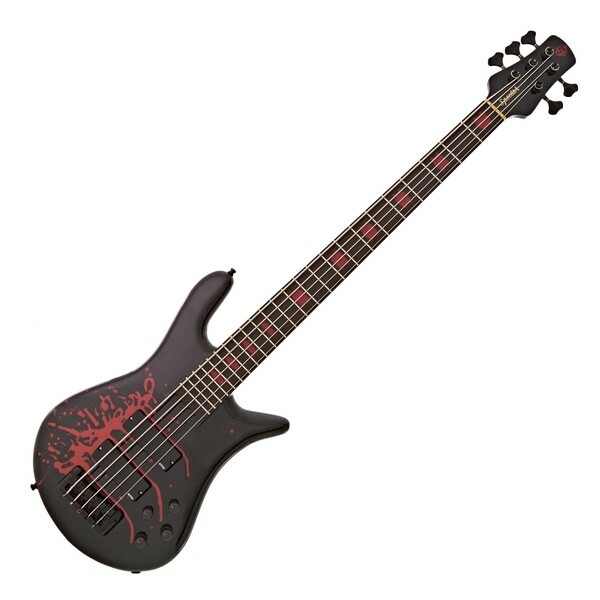 The Alex Webster Signature Spector has a thinner neck profile (front-to-back) than our typical Euro5LX model. It also features a solid Ebony Fingerboard and EMG DC humbuckers and the EMG BQC 18-volt tone circuit. With attitude to match the sound, Alex's bass sports a "Blood Splatter" paint job, red Crown Inlays and matte black hardware. For over 20 years Alex Webster, the bassist for Cannibal Corpse and Blotted Science, has been at the forefront of the Death Metal genre of music. Alex's three-finger "galloping" style gives him some of the technically fastest riffs in the music industry and as such he needs a bass with a neck that was built for speed.